For upholstery fabrics that look fantastic under any condition, trust the Sunbrella Shift Collection. These incredibly durable fabrics are composed of a distinct blend of Sunbrella acrylic, PVC, and polyester. The line merges vintage designs with modern-day fashion for versatile themes. 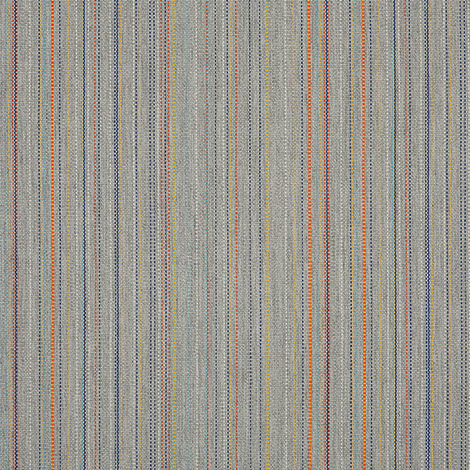 Escapade Fusion (57009-0000) sports a beautiful stripe pattern of greys and other colors. Uses include decorative pillows, patio furniture, slipcovers, home accessories, curtains and drapes, and much more. The maintenance-free fabric is both mildew repellent and water resistant. Warranty: 5 years. Width: 54 in. Weight: 12.5 oz.